With the tech selloff from yesterday on the Nasdaq and the Asian session lower this morning, we might see safe havens come back into play sooner than later. With the global uncertainty we might see investors move into gold and gold stocks as a safe haven play. Looking at the chart we might see the price of gold move higher from the $1225/oz level which coincides with the 61.8 Fibonacci level. A possible target price might be back to major resistance around the $1237/oz price level. Platinum has broken out of its downward channel and formed an inverse head and shoulders technical pattern which indicates a reversal in price action. The price action is trading above the 846 level which was the neckline of the pattern. The price action might move higher from here with a possible target around the 877 level. Bren crude is still very topical at the moment as the market is still digesting the news from Saudi Arabia looking to cut supply even further. Oil has been trading in a descending channel and is approaching a major support around the $64.77 level. 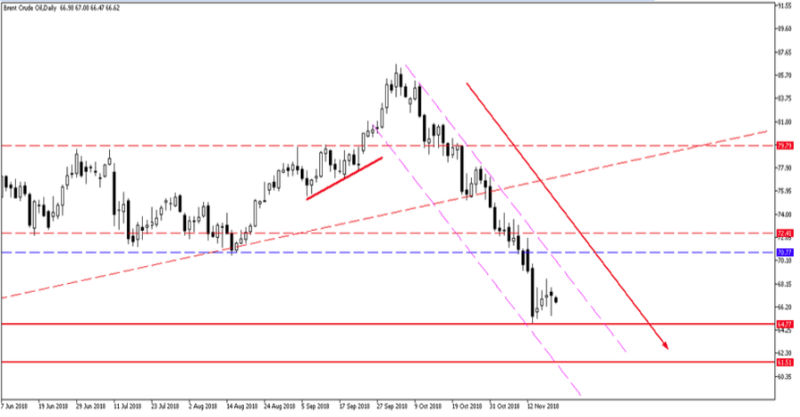 We might see the price of Brent move lower still if this support level does not hold with a possible target around $61.51 level.